The poor country boy Nemorino is in love with Adina, a confident landowner, but she is way out of his league—financially and otherwise. But when he buys a “love potion” from a travelling quack, the results are rather more than he bargained for. Charmingly staged by Bartlett Sher, Donizetti’s beloved masterpiece combines deft comic timing with touching emotional depth. 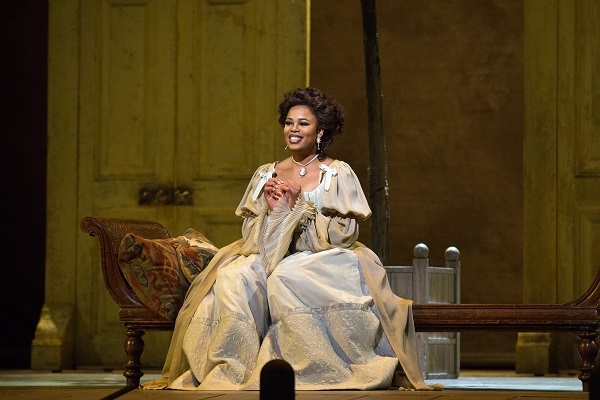 The production stars Matthew Polenzani, who enthralled Met audiences as Nemorino in 2013 with his moving “Una furtiva lagrima.” Rising South African soprano Pretty Yende is the spirited Adina, Davide Luciano makes his Met debut as the arrogant soldier Belcore, and Ildebrando D’Arcangelo is the potion-peddling Doctor Dulcamara. Domingo Hindoyan conducts.